Teaching irregular verbs is really difficult. I have tried many different methods and I still feel that I have not succeeded. You can see several of my previous attempts at this site. For example there is a post on irregular verbs using associative method or a post with a rap with irregular verbs or a post with remembering tables. In this post I will try to teach the irregular verbs in context. I do not want my students to spend more time doing what we have already done. I want them to do something new with the irregular verbs which we have already dealt with. In this post there are several quizzes, a mind map, four mnemonics a worksheet and a comic. I hope the results will justify the time spend on these. The aim of such an activity is to show the gap and suggest that by the end of the lesson they will know all the past tenses. Of course, you could just use the worksheet as is. However, here are several improvements which you might find useful. The first one is a mind map. It contains all the verbs in the past tense. 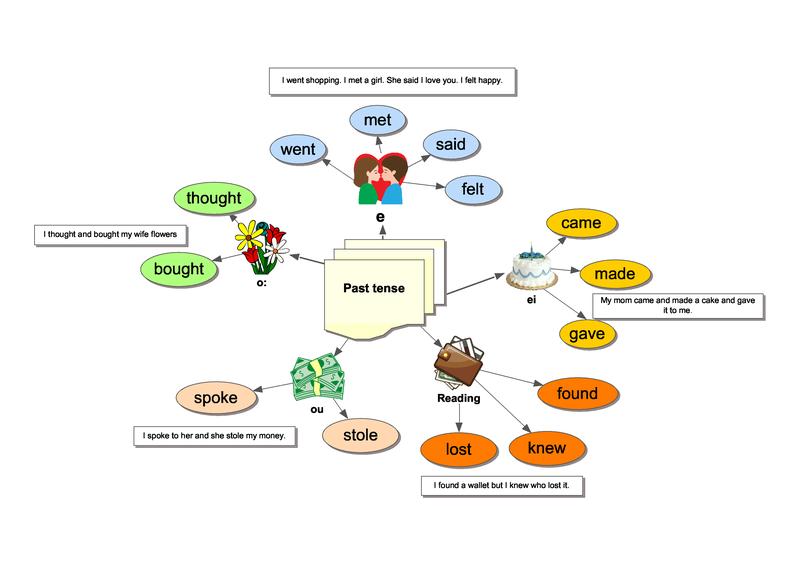 I think that the best place to introduce the mind map is after the activity 2 (the reading). Moreover, there are the four mnemonics which should help the pupils remember the irregular verbs. Ask the students to memorize the four lines. Thus the students should learn all the irregular verbs. If your students have smartphones and your school is pretty hi-tec, you could use the following quizzes. In the second quiz students have to complete the text with the past tense of the verbs in brackets. If they get more than 70% of answers correct, they can play the game Tic Tac Toe. In the third quiz students have to put the words into the correct order. Once again, if they pass the quiz they will get a chance to play the game Tower defence. If you teach the above lesson, you must not miss the last step. The post test. Once again ask your students to write the past tense and past participles of the irregular verbs above or they could try the following interactive quiz. I hope that the results now are much better than they were at the beginning of the lesson. It was very practical lesson,I enjoyed that. wow, you present so many different ways to learn English Irregular Verbs . That’s a good thing though, as Irregular Verbs in the English language are really important. Lots of these verbs are in very frequent use and one can not encourage enough to learn them all at a very early stage! I hope this piece of communication finds you healthy. I am writing to give information about the video that was posted on this page. This video was quite confusing and inefficient, so I would like to see something more interesting. However the other things related to English learning is awesome. thank you for commenting. Please, could you specify what was confusing about the video.